while the second was called the "Continuation war", and was started by Finland. The little Finland lose both the war against the Soviet Union, outnumbered by the enemy, losing Portions of the national territory but saving its indipendece. The most part of the finnish weapons were designed by Aimo Lahti, his best success was the Suomi M-31, a very realiable and cheap machine gun. Simo Hayha was an incredible guy, I read he didn't use a scope, but nevetheless he killed more than 500 enemies. Biggest kill count of any soldier single handed of all times, now imagine if we could clone him! Heck, a real nightmare for enemies. Finns had a pretty impressive collection of small arms for such a small country. Most countries their size relied on foreign bought or licence manufactured arms. I gues Mr. Lahti was a godsend. Mr Lahti was a very prolific designer indeed, a sort of a Finnish Mr. Browning. 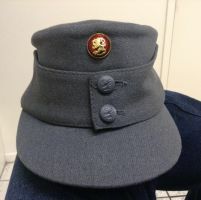 Upon further research I discovered that the officer cap Should have this cockade. Thank you very much, a little tribute to country that I really admire. Was the Lahti L-39 used? Non lo sapevo, molto interessante come sempre. Mi piace molto il design dei berretti e dei caschi. Can you do a Prussian set or series, ww2? Excellent Work Old Boy. Poor Finland couldn't catch a break from Stalin. Not always David is the winner against Goliath, even though we often do cheer for him. I didn't know this quote, thank you! no prob, it's said to be a popular saying by the Finn's during the Winter War. Always interesting to read the historic information that you provide. In all honesty, I thought the winter war was more of a sucess for the finnish, as they caused 60% of the russians fighting force to die in the conflict. They covered themself of glory, but they were outnumbered, but nevertheless at the end of the folks they saved their indipendence, and looking to the Baltic States, this was a great goal. And in reality, that's all that mattered. They were independent. Then again, any small, non-nazi, country that deals an above-amount-of-damage to the Soviets is a hero to me. They were both hero and wise, they knew that they had to firm an armistice in 1944. Stunning work! That Lahti pistol is a beauty. Did he design the LS-26 shown? Also, did you know there was a Hungarian volunteer battalion, which also had British soldiers? "Osasto Sisu"! I understand quite a few people volunteered to help little Finland. Yes, it was the Lahti Soloranta. I didn't know, in that time people was more determinated that now, just to think about the International Brigades in Spain....... Left or right wing never mind, but there were people willing to fight for an ideal in a foreign country. That's a good point. I hadn't thought of that, but I think you're right! The texture of the M39 cap is so nicely done that I can almost feel that fluffy fur.